The Challenger is a little sister to the Explorer. 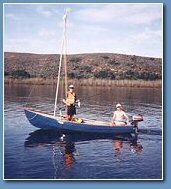 14 feet long, with either a standing lug or gunter rig, she is a quick, responsive boat that feels bigger than she is. The simulated clinker hull is built of GRP and has plenty of volume and buoyancy. The boat is dry in all but the worst weather. The cockpit is large enough to accommodate the classic family of four, with space for the picnic basket as well. The boat rows easily, and a small outboard motor can be mounted on the transom. The Challenger is pretty. The lug rig evokes thoughts of "Swallows and Amazons" and the adventures of youth. She invites adventures in sparkling bays and muddy estuaries. She can be bought as GRP hull and deck or complete, from Sentinel Boats. Email us for info.